The Grand Rapids GOSite recently opened with a ribbon cutting ceremony and public celebration. Conceived as a modern take on a welcome center, it will be the new go-to hub for Grand Rapids area visitors and locals alike. 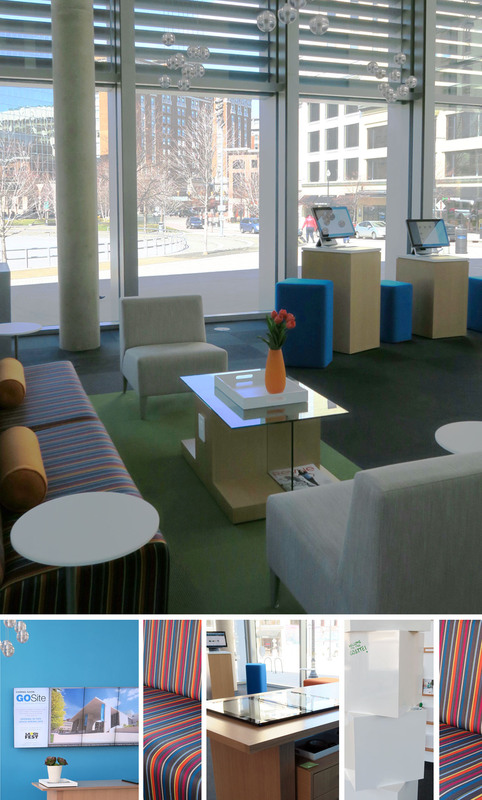 We designed the space on behalf of Steelcase, as part of their ongoing support of our community. Many other community partners contributed, as well. There was an unusual requirement for this. The challenge was to create an experience that is in character of an Art Museum. This space is nestled into the wings of the Grand Rapids Art Museum. Not a problem. We had a lot of fun getting the design to feel “just right” — an engaging, well-designed, modern traveler’s oasis. The space is a collection of interactive displays, comfortable lounge settings, charging stations, and a ton of great content from partners, all hosted by a charming GOSite Ambassador. It’s a perfect rendezvous spot for meeting up with friends to decide what the night will bring or regrouping with family during a day downtown. It is smack dab in the middle of all of the action. With the GOSite you can track down the hot events in GR, discover a new restaurant, or find out about a cool gallery opening. Locals, give it a try – maybe you will discover something new about your home town.